In March it was UCT’s turn to host the Legal Practitioners Forum meeting, held twice a year, staging the event at the GSB. 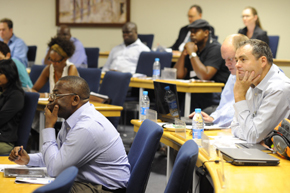 Legal eagles: Legal advisors from universities across South Africa had plenty to ponder. 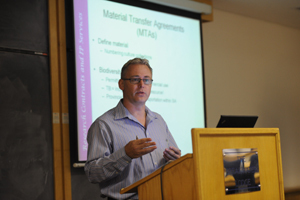 Making the case: UCT’s Dr Andrew Bailey spoke on the complexities of IP at universities. Some 28 legal advisors from universities across South Africa were among those who put their heads together to discuss and compare notes on recently promulgated laws that affect academia. Topics under discussion included the new Consumer Protection Act, the Safety at Sports and Recreational Events Act, and the Intellectual Property Rights from Publicly Financed Research and Development Act (aka the IPR Act). Speaking on the IPR Act, Dr Andrew Bailey of UCT’s Research Contracts and Intellectual Property Services outlined the intellectual-property (IP) challenges associated with research collaboration and commercialisation agreements. IP arising from such research will belong to the university in terms of the Act and researchers who developed such IP will receive a benefit share. “It’s about finding a fair way to distribute the revenue,” observed Claude Bassuday, director of Legal Services & Secretariat at UCT. Bailey stated that UCT’s IP Policy is currently under revision to comply with changes in the legislative landscape and to bring it up to date in relation to new developments such as Creative Commons and Open Source. The IP Policy has been put to Senate for review. The forum’s next meeting is scheduled for August at the University of the Witwatersrand.